China and Russia will conduct a second joint anti-missile exercise next year. The announcement, on Tuesday, was made at a China-Russia joint press briefing on missile defense on the sidelines of the Xiangshan Forum in Beijing, a high-end meeting of defense officials and experts. 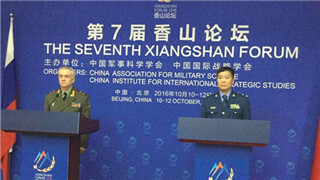 The two countries held a joint computer-simulated anti-missile drill in May. Observers noted that Beijing and Moscow have increased their anti-missile cooperation this year as the United States and its ally, the Republic of Korea, pushed forward a joint plan to deploy the long-range Terminal High Altitude Area Defense (THAAD) anti-missile system in the ROK. The X-band radar associated with the THAAD system has a maximum range of 2,000 km, a radius which is capable of covering parts of China and Russia. In a joint statement on global strategic stability released following the meeting between President Xi Jinping and his Russian counterpart Vladimir Putin in June, the countries voiced shared concerns over the deployment of antimissile capabilities globally and said that any unilateral deployment is a setback. At a China-Russia Northeast Asia security consultation in Moscow in July, Beijing and Moscow agreed that they will "proactively consider strengthening bilateral coordinating measures" to tackle potential negative factors posed by the deployment of THAAD.